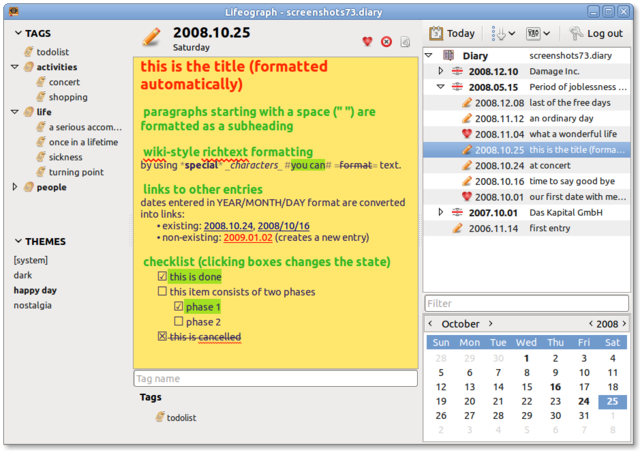 Lifeograph is a personal journal and note taking application. It offers all standard features expected from a diary application, along with some unique ones, in a light-weight and intuitive package. So where’s all the controls for formatting, or a help file that tells me how to do it. That screenshot looks impressive, but when I boot it in Mint, there are no tags or info on how to tag something. Other note apps are much better, imho.